That's what four Republican presidential candidates want to do. Ben Carson, Ted Cruz, Rand Paul and Mike Huckabee have all said they would so radically simplify taxes that they would put the IRS out of work. Under his tax reform proposal, Cruz even said filing one's taxes will involve nothing more than "a postcard or iPhone App." A single postcard-size form does sound simple. But processing and verifying the information on 140 million of them sounds ... well, a lot less so. "You may not like our tax system. But getting rid of the IRS doesn't get rid of the need to administer our tax laws," said Martin Sullivan, chief economist at the publisher Tax Analysts. The candidates themselves seem to tacitly acknowledge the need for a tax agency even if it's called something else. They've sometimes softened their rhetoric, saying they'd "end the IRS as we know it" or "abolish it and replace it." None of the campaigns got back to CNNMoney to explain what the candidates would do instead if they shuttered the IRS. But someone who would be very happy with a no-frills tax system didn't mince words: "You have to have a revenue agency," said Stephen Moore, who created the conservative Club for Growth and has consulted with Republican candidates on tax reform. That said, he added, "you can change the way we collect taxes or dramatically simplify the system. 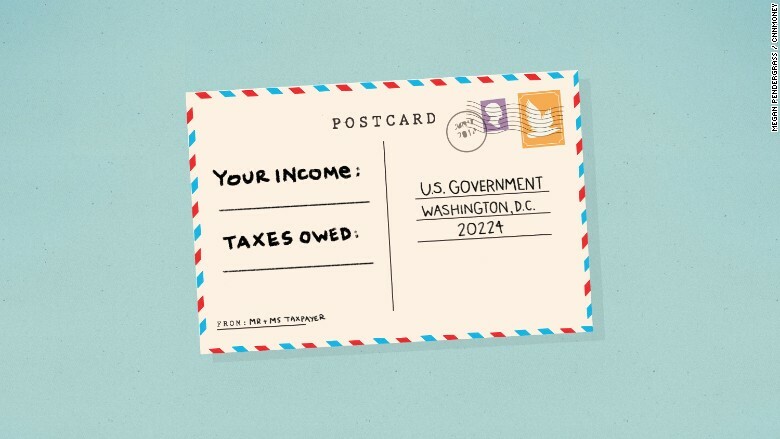 And [that] would substantially reduce the IRS' presence in our lives." A national sales tax to replace the income tax -- which is what Huckabee is proposing -- would mean individuals and businesses simply pay taxes on the goods and services they purchase, rather than on their income, savings or investments. A flat tax -- which Cruz and Carson are proposing as is Paul, who combines it with a sales tax -- would impose a single rate on wage, business and investment income above a certain amount, and would disallow most tax breaks. And all four candidates say they would repeal many if not all of the following: the Alternative Minimum Tax, the payroll tax, the estate tax, and tax provisions related to Obamacare. Putting aside the question of whether the candidates' proposals could raise enough revenue to run the country and other critical details, those kinds of changes very well might eliminate or simplify many of the administrative and oversight duties that the IRS performs today. But "you still need a revenue agency to collect the money, match the documents, answer people's questions and ensure compliance," said Len Burman, director of the Tax Policy Center. The IRS currently processes more than 140 million returns a year, collects $2.7 trillion in taxes, issues $400 billion in refunds and conducts over 1 million audits annually. Among the most basic responsibilities of the agency are to collect W-2s and verify income, review tax returns, collect taxes, audit taxpayers suspected of not paying what they owe and pursuing unpaid taxes in court. The agency has other critical duties, too, above and beyond collecting taxes. Congress requires the IRS to oversee key economic subsidies such as the Earned Income Tax Credit for low-income families, the mortgage interest deduction and charitable contributions, all of which Cruz and Paul say they would preserve. Add to all that the agency's growing and still underfunded efforts to combat cybercrime and tax-related identity theft, and it gets harder to see how you can abolish the IRS and replace it with something drastically smaller or simpler. The IRS has plenty of problems and there's a lot it can do to improve, Sullivan and Burman said. "But efforts to demonize it don't seem to be the solution," Burman added.